You may be under the misguided assumption that there is a child in your family cuter than my niece. Let me assure you, you are wrong. 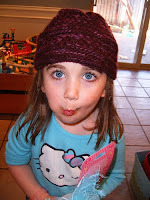 This is my adorable niece hamming it up in the Amanda Hat I knit for her. And here is her equally-adorable aunt in a coordinating Amanda Hat. And, um....here's my older bother. As you can see, we are a family of camera-whores. It's genetic. Look at those eyes!! Let's cast her in a Utica spot...wait, that whole child star curse has proven quite true. This just in, Gary Coleman is getting divorced. Seriously, I read that just today.